An interesting question at Hyperscale provided food for thought about the colours of the Imperial Japanese Navy's Nakajima J1N "Irving" in its various incarnations. It is easy to perceive the IJN colour schemes as "boring", plain dark green over grey, especially if one resorts to standard hobby paints like Tamiya IJN Green and IJN Grey. But explore a little deeper and there is a rather richer seam to be mined. "I have spent a bit of time doing some wreck hunting in the south pacific and have seen an early Irving from the exact unit and time frame in question. The 60+ years of weathering has of course removed most of the paint, however the undersides seem to be in NMF. There is red oxide primer remaining and it seems to have been sprayed freehand over the upper surfaces with no discernable paint below. You can see where the primer ends in a soft demarcation and there is no trace of it below that. Comparing it to other wrecks that are known to be NMF beneath shows a similar pattern of remaining paint. It would be a fair assumption that if there was no primer on the undersides then there would have been no paint." Now it can be very difficult to determine light grey paint from oxidised natural metal in photographs, but in this case the photographs studied suggest that they were indeed unpainted natural metal. 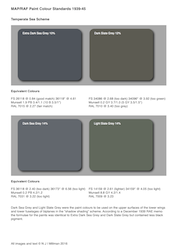 These two pieces of complementary and corroborative evidence beg the question what did the various published references use as a basis for presenting the undersurfaces as light grey? Mr Mikesh identified the original external paint on the NASM J1N1-S Irving s/n 7337 as Thorpe's N2, equivalent to Munsell 10 G 3/2. At first this appears counter-intuitive. Surely on a nightfighting aircraft the black green of N1 would be more appropriate? Then one considers the characteristics of NIVO (Night Invisible Varnish, Orfordness), a dark grey-green, and the RAF experience to summise perhaps that the Imperial Navy were discovering for themselves that the most effective night camouflage paints were lighter. But it is more complex than this. In his examination of Japanese aircraft colours at NASM in the Asahi Journal Vol.3 No.1, Mr Mikesh measured the surviving extant paint traces on s/n 7337 as being to a Munsell value of 1.9G 3.0/0.7, which he equated to the closest Munsell standard value of 10 G 3/2. 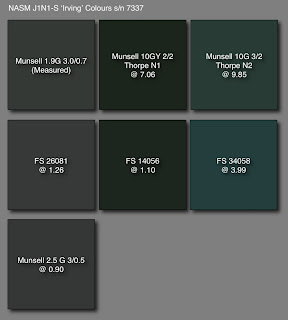 How this conclusion was drawn is unclear because as may be seen from the analysis here the measured value is actually slightly closer to N1 and closer to the value of 2.5 G 3.0/0.5 - a green so dark and with so little green chroma that it is almost a dark grey, as the close comparison to FS 25081 reveals. Was this a dull and faded N1 or N2 with much of its green chroma robbed by time and temperature? It is always tempting, in the absence of other evidence, to assume a continuous standard provided by a single extant example. This is not entirely foolproof, because aircraft production painting is rarely an undeviating continuum but instead usually reflects a series of modifications to answer changing logistical or operational needs. We need go no further to find a striking anomaly than Gallagher's 'Meatballs and Dead Birds', where an abandoned 'Gekko'at Atsugi, tail code 'YoD-172' is described as having been painted in a "shade of green unlike any other at Atsugi", a green compared to the colour of the seal on the front of a dollar bill. Courtesy of a valued correspondent in the USA suggested matches for the green in FS 595b are 14090, reported as slightly too intense, 14120 which has a slight grey caste and 14115, the closest although lacking yellow. Of course these can only be approximations but the colours are included to give an impression of how bright this green may have appeared. 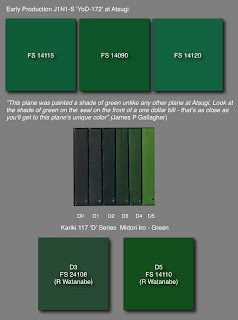 That such bright greens existed in the paint colour standards is confirmed by the extant Kariki 117 'D' series swatches shown here, including Ryôichi Watanabe's suggested FS 595b comparisons as reported in Arawasi magazine Issue 9, Apr-Jun 2008. Early Irvings at Rabaul look very dark, almost black in photographs, and with all the usual caveats about the dangers of interpreting b/w photographs it may be that they were painted in the equivalent of N1 on the upper surfaces only, before being shipped south. The irony here is the possibility of the exact opposite of what we once believed, that in reality these aircraft undertook their first operations in a very dark, almost black green and finished up as nightfighters wearing much lighter greens. However the authors of the modeler's eye series monograph on the Gekko draw an opposite conclusion, reporting that the earlier aircraft appeared to be a much lighter green, "believed to be the result of in-field painting of unfinished (silver) aircraft without proper priming, resulting in the lighter appearance." That conclusion is difficult to draw from the photographs studied and the description of the colour schemes is somewhat ambiguous in its reference to the "all dark green scheme". The book is mainly a vehicle for building the Tamiya 1/48th kit and the colour information is confined to a generic description "dark green" and the citing of Tamiya paint AS-1/XF-11 'Dark Green' which appears to be more like N2. 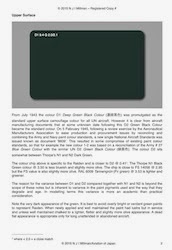 The Fujimi Irving kit instructions suggest a "Blak Green" (sic) equivalent to FS 34077, achieved by mixing 80% H59/15 (IJN Dark Green Nakajima) and 20% H12/33 (Black) but make no distinction between the colours of early and later models. This FS value is closer to N1 than N2 (3.53 to 6.52 where >2.0 = a close match), but as may be seen the Munsell value for N1 is greener and richer than the FS value suggested. The closest Munsell value to 34077 is 7.5 GY 2/2 @ 3.5o but it is only a smidgeon ahead of 10 GY 2/2 (N1) @ 3.53. The closest FS value to N1, and it is very close at 1.10, is 14056. This value is also close to Munsell 7.5 GY 2/2 @ 2.08. If you have followed thus far and not yet fallen asleep the reasonable conclusion is that Fujimi are suggesting the black-green N1 as the colour of Irving. 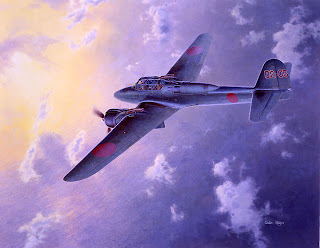 K Koizumi's painting of the early production J1N1-S '02-03' of the 202nd Ku in FAOW 57 depicts a green resembling N2 rather than N1, but it is a more yellowish - or cadmium - green of a similar hue to that seen on the Zero in the Atsugi colour film. The profiles show two different greens, with a lighter more viridian colour for the early production examples with unpainted/grey undersurfaces and a colour slightly more towards an olive green for the overall green painted aircraft. Both could be said to be approximations of N2 rather than N1 but the actual dark green is not referenced to Kariki 117. 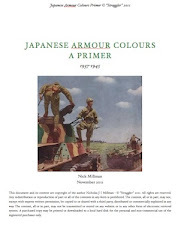 In Model Art 272 translator Dr Widman Livenow describes the Irving colour scheme as"deep green-black with lower surfaces in ame-iro(sic)" suggesting N1 rather than N2. The original interior colours of the NASM example have been documented as being partly finished in the exterior colour N2 and partly in 'aotake', the blue-green translucent protective coating that results in a "metallic" appearance to the paint surface. Again, in the absence of data for earlier machines it is tempting to take this as typical and use it as a guide for all Irvings. However, the finish has all the hallmarks of late-war expediency, in the partial painting and use of external paint colour, so it may not be the most appropriate choice for earlier aircraft. As a Nakajima aircraft it is possible that the interiors of earlier aircraft reflected paint colours similar to those found on Nakajima-built Zero aircraft. 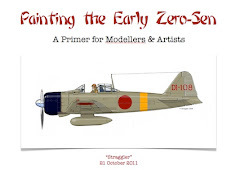 A continuation of this article will explore detail colours and the relevant hobby paints. 1. Hyperscale "Plane Talking" post on October 17 2009 at 9.12 p.m: "Alright, don't y'all freak out . 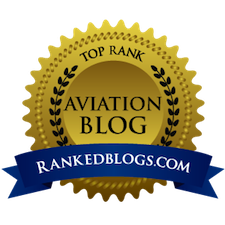 . . "
YoD-172 has been an airframe of particular interest to me ever since getting my first copy of "Meatballs and Dead Birds". There are also a few other unique aspects of this airframe beyond the unusual bright green paint scheme. 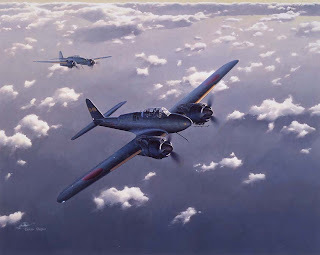 First, Gallagher also reported that this aircraft carried a single oblique mounted cannon, where other Gekkos from Atsugi carried at least two dorsal weapons, with some later build airframes carrying three 20mm cannon. Also note that this was an early "hunchbacked" Gekko, yet she was field modified to carry the later style ejector style exhausts as seen on late build versions. I have tried to take into account that when Gallagher photographed and described this airframe, she had sat derelict for awhile. The paint had surely faded some from the original color, yet he was adamant that no other airframe at Atsugi wore this color green. This is personal supposition, but I feel that this aircraft may have had a specific role in the unit to have been modified in three distinct ways. As a side note, at least three older Gekko airframes had been modified at Atsugi to carry the later exhaust configuration- and one image shows a very dark and highly polished example with kill marks. There may not have been such a thing as a "standard" Gekko based at Atsugi. Thanks as always for such a great and informative post Nick, keep up the great work! A quibble I noted regarding Monday's posting. I do not believe Munsell 2.5 G 3.0/0.5 should be referred to as a standard Munsell value. I do not think there is a standard color chip in the 'Munsell Book of Color' beyond a full integer value of a 1 or a 2 at the right most position of the Munsell numerical code sequence. As you said, the gray factor is so great by the time the final digit is down to a 1 or a 2, there is very little discernable color left. I believe this to be true for all color hues. I agree with your unease concerning the NASM rendition of their J1N1 cockpit. The paint work looks too American, not at all Japanese in execution to my eye. I do not believe the visual appearance of the average IJN cockpit was so well turned out or uniform appearing. 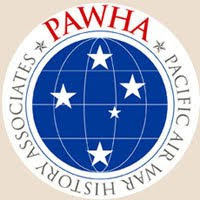 Perhaps this plane was, immediately after final assembly, but this condition would change immediately after routine maintenance of any removable equipment in the cockpits, with expedient swap outs of functional or re-tuned equipment. It is most unlikely the replacement equipment from 'spares' were in colors exactly matching to those of the main airframe's factory finish. Radios were all crystal based at the time, so frequency changes had to be done 'on the bench'. I suspect this chore was an immediate requirement as soon as any airframe left the home islands and entered jurisdictions further afield. Japanese electrical equipment of the era seems to have had a notorious reputation for reliability, I would think the electrical areas of the internal finish would show evidence of too many hands on them relatively early on, further degrading any original pristine appearance, as seen with the NASM re-paint of their J1N1. Thank you both, Dan and Ken, for these valuable additional comments. Ken, I agree regarding that Munsell value. It is included in the software as a "standard" rather than calculated value but I shall amend it accordingly. Thanks for the informaitve post. I am interested in your commentary on the Fujimi recomendation for a very dark (N1) green for the very earliest operational IRVING'S. Yes indeed, I believe it is not only possible but more probable that the early Irvings had natural metal undersurfaces rather than painted grey undersurfaces. I don't see YoD-172's refitting with ejector exhausts as anything more than the obvious performance enhancement doing so would provide. Are there photos of any J1N1s at Atsugi, with the ejector exhausts, but not retrofitted with oblique guns? Even if this possible correlation were the case, how could we tell for sure? I doubt Mr. Gallagher himself photographed or physically inspected every J1N1 he saw there sufficiently to determine whether such a correlation existed. YoD-172's single oblique gun arrangement may have been due to any number of causes. One airframe had to be the first so retrofitted, maybe YoD-172 was it. Such a first of a kind status may also explain the different shade of green it was repainted. The airframe may have been serviceable but degraded, say due to prior heavy landings or some such. The all up weight it could tote, or the gun recoil stresses the armorers felt comfortable imposing on the airframe may have been limited in some way. That color of green may also have been used because it was the only stuff on hand when YoD-172's time for a repaint came up. Nick has suggested lighter colors work better on night fighters. Given the range of potential causes for the color Gallagher described, we will likely never know a rationale, if any in fact existed, on that one. Thanks for your thoughts on the subject.....I have been studying the Gekkos from the 302nd for around 5 or 6 years now, and when you take into account all the known images from various publications including Meatballs and Dead Birds, YoD-172 was a really unique airframe. All of your points are well taken and are very likely scenarios. The text of Moonlight Interceptor mentions that at some point it was thought having a single oblique cannon was the way to go, as far as saving weight and gaining speed. That said, later airframes seen at Atsugi carried the two or three gun complement so it must have not had enough firepower to do real damage with a single gun.